Sure beats sitting behind a desk. It's a shame, then, that video games never seem to do it properly. Modern flight is a fast, thunderous and terrifying thing. Even commercial flights have moments of heart-stopping power, at points like take-off and landing. There's engines thrumming, wind rushing past at impossible speeds, forces acting and reacting against every movement an aircraft makes. Yet when we get behind the stick in a game, whether it's a console title or a PC simulator, it's often an incredibly dry, sterile experience. The physics might be accurate, but the feeling isn't. Look at this clip as an example. 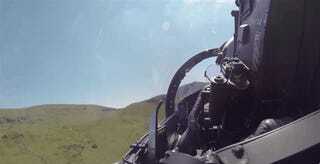 This is what it actually looks (and sounds) like to fly a modern jet fighter. It's an RAF Typhoon, and even though it's taking a leisurely stroll over the British countryside, it still gives the sensation that it's a total rush. There's wind buffeting the cockpit, everything's got a shake to it from the engines, etc. I want to be doing this in a game. And this clip doesn't even have things to shoot at.